In a move to equip publishers with better understanding of copyright, the Philippines' Department of Education recently conducted a two-day orientation-seminar at the DepEd headquarters in Pasig City. 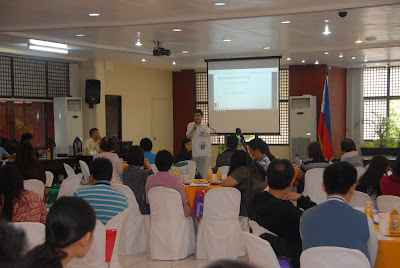 Alvin J. Buenaventura discussed "Secondary Use of Copyrighted Works from the Internet" before officers of the education department and 52 representatives from 28 publishing houses. Buenaventura before DepEd officials and private sector publishers. (Photo by DepEd staff). 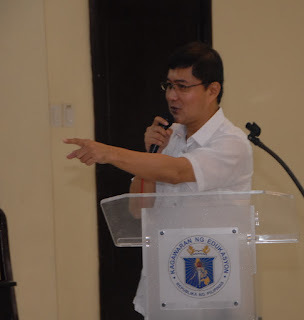 Buenaventura is the Executive Director of the the Filipinas Copyright Licensing Society, Inc., the collective management organization in the text and image sector operating in the Philippines. FILCOLS licenses the re-use of copyrighted printed materials of its member-authors and publishers. Due to the urgent need to provide learning materials for the government's then new K to 12 program, the DepEd signed a license agreement with FILCOLS in 2013 so it can include poems, stories, comics, and other works for the Grade 1 and 7 Teachers' Guides and Learners' Materials. Buenaventura explained how a CMO like FILCOLS operates. And provided a picture of how other CMOs cooperate through the International Federation of Reproduction Rights Organizations (IFRRO), the world's umbrella organization for CMOs, authors' and publishers' associations. Buenaventura emphasized the need to respect the rights of authors. (Photo by DepEd staf). He also stressed that the default mode of every one when it comes to works on the internet is that they have copyright. Texts, images, and music found online should be respected and not just used without asking permission from the copyright owner. Unless the website expressly states that their content may be used freely, everyone should remember that copyright extends online. Atty. Louie Andrew Calvario of the Intellectual Property Office of the Phiippines (IPOPHL) discussed "Copyright Issues and Concerns" prior to Buenaventura's presentation. The event was organized by the Bureau of Learning Resources led by Dr. Edel B. Carag and Dr. Dina S. Ocampo, DepEd's undersecretary for curriculum and instruction. The seminar mainly aims to help publishing houses get a clear picture of the "standards, specifications, evaluation and procurement procedures" of the DepEd to help them produce learning resources for the public schools.